ADITI MANGALDAS(New Delhi) is the choreographer and principal dancer of DHRISHTIKON DANCE FOUNDATION. 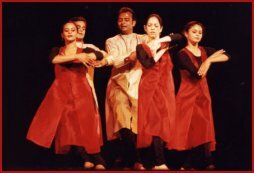 A performer and choreographer of great repute Mangaldas uses her strengths of the kathak style of dance to reach new forms, create new spaces and evolve a new vocabulary – she constantly looks at the ancient dance form with a modern mind and gives it contemporary dimension. An extract from the larger production, "Rhythm and Sound" explores the vibrant sounds that echo through dance,discovering silent rhythms, going beyond traditional footwork, to explore new expressions of rhythm and sound.